You are here: HomenextExplore our archivenextPlacesnextA miscellany of placesnextSlea Head Drive, The Dingle Peninsula. 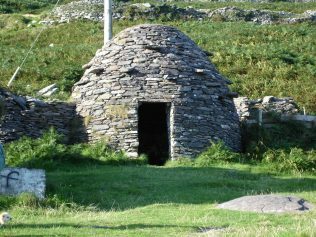 Remembering Beehive Huts, and the Gallarus Oratory. The oratory pictured by Ingo Mehling (again, shown courtesy of Wikipedia). Asked what I remembered about the Dingle Peninsula, I recalled the narrow lane with passing places meandering along the coast on the Slea Head loop, offering magnificent views of the Blasket Islands and deserted beaches; I remembered the hedges of tumbling fuchsia bushes, alternating with the vivid orange of crocosmia, and I thought of the stone-built bee-hive cottages. And then, with a shock I realized: I was actually remembering a trip I made not recently, but half a century ago, when I was but a lad not yet in my teens! And so it was with great anticipation that fifty years later I started out on a return visit to this beautiful area – to re-examine exactly why that first (and only) visit was so memorable. 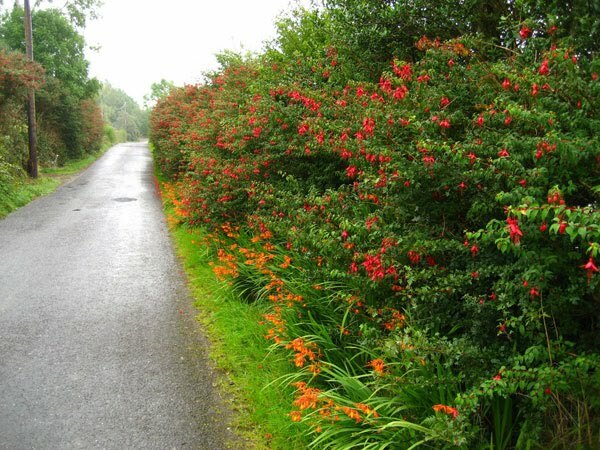 The winding lanes were exactly as I had remembered – the steep and rugged hills rising sharply above the coast, the hedges still ablaze with scarlet red and flaming orange. And the curious stone huts, known more correctly as clocháns, are still dotted around the hills, often in the yards of farms lining the road. I was intrigued: who built them and when? What were they used for? Were they Bronze Age relics or more modern derivatives from ancient structures? The answer is not always straight-forward: archaeologists think that the structures were first built in the Bronze Age but continued as a building technique until perhaps 1200 A.D. More recently-built clocháns were simply intended for storage or agricultural use. The walls are thick – often up to one and a half metres – and have a corbelled roof. Corbelling is achieved by placing the upper stones in such a way that they project inwards in each successive layer until the sides meet in the middle and are held in place by their own weight. It is a technique which means that every facet of the sandstone blocks has to be first cut and shaped. Sometimes you find several clocháns joined together. The early ones have a circular footprint, and it is thought that those with a rectangular base are probably the more recent. There are also examples which appear to have had a thatched roof, but the corbelled variety give the structures their traditional “beehive” appearance. Dating the structures is not easy –the skill derived from craftsmen who are first known to have used corbelling in Newgrange as long ago as 3100 BC. Some have surmised that the present clocháns date from 1200 AD, when the Norman invaders drove the farmers off their better lands, forcing them to take shelter on the poorer soils of the slopes above the shoreline. As a building technique (dry-stone walls made of carefully cut sandstone blocks, tapered so that the successive layers drain the water away from the interior), these clocháns are linked historically to structures in the Scottish Isle of Iona and to the buildings on Farne and Holy Island off the North East coast of England. In all probability they had a religious use – possibly by monks following Saint Patrick. There are records of perhaps 400 clocháns along Slea Head Drive, a loop some thirty miles long, stretching westward from delightful Dingle Town. 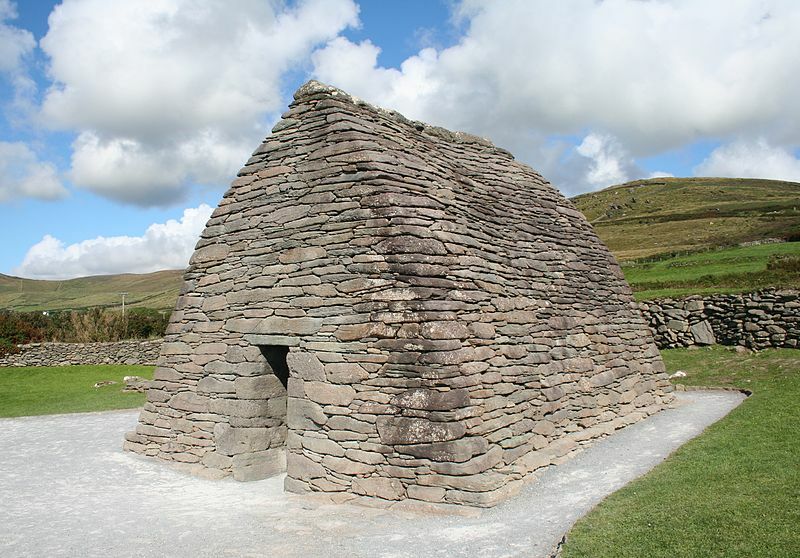 But of all the corbelled structures, the Gallarus Oratory (in effect, a tiny church where prayers were offered) is the most remarkable. It is situated overlooking the harbour at Ard na Caithne (formerly also called Smerwick Harbour). “Gallarus” apparently comes from the Irish name Gall Aras meaning “The House or Shelter for Foreigners”; the foreigners are believed to have been pilgrims who had come from outside the Dingle Peninsula and who presumably settled here to worship and to eke out a meagre living in the harshly beautiful countryside. It is well worth the short walk up through a field to get to the site – the majority of tourists pay to park, and for that they get to see a video explaining the context and history of the building. Others head straight for the free parking nearby, and enter the oratory after ducking beneath the flat lintel just 5 ft 5 inches high. This leads into the single room inside the structure, measuring roughly fifteen by ten feet. Inside it is somewhat dim, for the round headed window faces east and little light penetrates the gloom. But if you are lucky to get there when the place is empty you can visualize what life must have been like a thousand years ago, with monks praying and going about their business, thankful for the shelter afforded by the thick walls and roof they had laboured so hard to construct…. The Slea Head drive has everything you could wish for – history, fine views, interesting walks, and above all, the certainty that you will end up where you started from: that’s Ireland at its best!